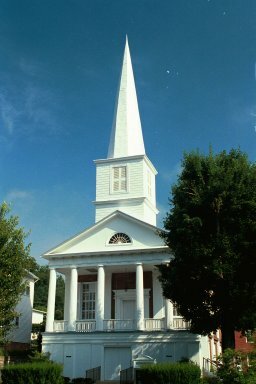 The origin of the Jonesborough Presbyterian Church is the founding of the Hebron Church in 1790 by Rev. Samuel Doak and Hezekiah Balch, and the first real meeting place was a log house built on the property of John McMahon. The congregation began to grown under the leadership of Rev. Doak's son, John Whitfield Doak, who was hired as minister of the Hebron Church in 1801. In 1816 the first permanent church building, a two story brick building which housed the Church and Martin Academy, was built on West Main Street, and from the beginning was too small to accomodate the growning needs of the congregation. In 1831 more land was aquired and a larger building erected, and was later replaced by the existing building in its present location. In 1834 the congregation totaled 96. From 1835-1846 the Rev. John Whitfield Cunningham, brother of Dr. S.B. Cunningham, served as minister, afterward moving to Indiana and Illinois with the ministry. In April 9, 1840 the name was changed to Jonesborough Presbyterian Church. In 1846 Dr. W. R. Sevier, William K. Blair, and John F. Deaderick formed the construction committee to build the spire for the church. See a vintage postcard of the slave gallery, now the choir loft. Throughout most of the Civil War the only two acting elders were Seth J.W. Lucky and Dr. Samuel B. Cunningham. In 1868, 51 members (Unionists during the war) organized a separate body and became known as First Presbyterian Church. They later built a new building which now the Central Christian Church. The two churches were reunited in 1943 in the original building. Read more about this church in Goodspeed's History of Tennessee.